Our cat Jack always seems to lie down in the most awkward place. 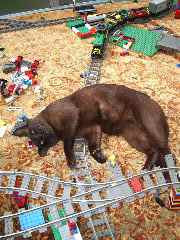 Here he is lying on the train tracks. He is a very insistent Burmese and he has all of us under control. Just like our cat! Welcome to bloggerland! Found your blog from signature line - Kiwi Quilters & I wondered if you had a photo of Jack on your blog. Might bump into you over weekend.